It's that time of year again! I love Easter because we have decided to bring back the tradition from when we were little of having lunch and a great egg hunt for all the little ones. Technically last year was my son's first Easter and although we got a basket, we had no clue what to fill it with since he was a newborn. I've compiled a list that I think would have been great for not only him, but really any baby's first Easter. 1. Groovy Holidays Loppy Easter Bunny Basket - Aren't these just adorable? I first saw them on Citrus Lane, but you can also purchase them on Amazon! 2. MAM Pacifiers - These are a favorite in our house! It was the first pacifier that we tried with Peanut and we didn't have to try any others. 3. Carter's 1st Easter Bib - Anything from Carter's lasts forever. Carter's always has so many adorable things for every holiday. 4. Annie's Bunny Grahams - This was an idea I had with older babies in mind that have already started eating more solid food. My little man loves them. 5. ATTITUDE's Bubble Bath Night Almond Milk - the cute chick design made me think of Easter. Soothing and hypoallergenic, it's made with worry free ingredients. 6. MAM Oral Care Rabbit - These come in blue or pink and are not only great for cleaning those first baby teeth, but also helpful in giving those tender gums a massage. You can check out my post for other Natural Teething Remedies, if interested. 7. Chronicle Books "You Are My Baby: Meadow" - "A new title in this series of charming and inventive board books! Readers will find a little book nestled inside a bigger one. Turn the pages to match the baby meadow animals to their parents, and learn early concepts along the way." 8. Zubels Knit Cotton Bunny Doll - I am going to be getting a Zubels Knit Doll to review, but we received a knit rattle and they are beautiful, high-quality, and at the perfect price point. 9. MAM Anti-Colic 5oz Bottle - These were the first bottles I gave my son and took to them instantly. My daughter never took a bottle, but we never tried these with her. They are unique design to reduce air and easy to sterilize with their built in system. 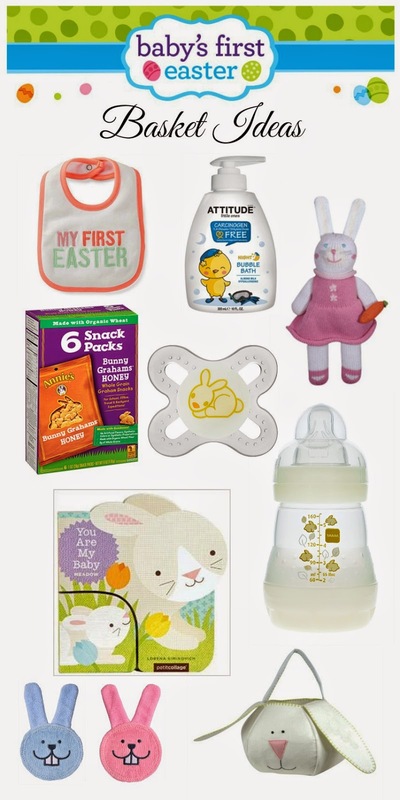 What are some things you would like to put in your baby's first Easter basket?